Even though it rains a lot in Seattle during the fall, winter and spring months, the summer months can be dry, dry, dry. So saving water is an important goal for homeowners in the region. Water conservation during the summer and early fall months can not only help homeowners save money on their water bills, but also ensure there’s an adequate water supply for salmon, habitats and other wildlife — while also keeping your plants and lawn watered and healthy. Conservation is so important that the city of Seattle and other local utilities will pay homeowners to save water. Yes, the city will give you money to save water! The Saving Water Partnership offers many rebates to homeowners inside and outside of the house, including rebates up to 50 percent of project costs for rain sensors, smart controllers, drip irrigation, sprinkler heads and more. 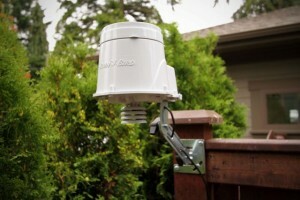 Weather sensor provides temperature and rainfall data to the controller for daily irrigation schedule adjustments. 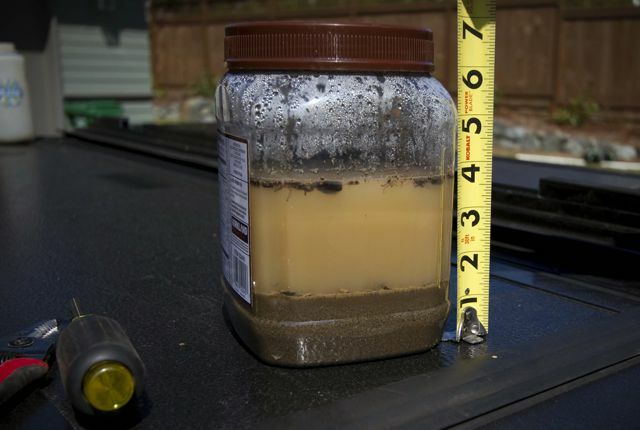 Ecoyards recently helped a conservation-savvy client in North Seattle apply for and receive $480 in irrigation rebates from the Saving Water Partnership. We did that by designing and installing a smart irrigation system that reduces water use by more than 50 percent. The basic idea is to have an in-ground sprinkler system with sophisticated technology that knows not only when to shut off the sprinklers when it rains, but also when to restart it for precisely the right amount of time based on recent rainfall amounts, while factoring in everything from soil type, plant type, to the slope of your lawn to the amount of sun exposure different areas receive. For our North Seattle project, we qualified for rebates by using drip irrigation on the landscape beds that slowly release water directly to plant roots; rotary spray nozzles on the lawn sprinklers that increase watering efficiency; check valves on heads with potential drainage problems; and a smart controller equipped with a weather sensor. We installed a state-of-art smart controller system from Rainbird, which knows when to water only when the landscape requires it. The sprinkler system automatically turns on and off based on different factors: the plant and soil type, the climate for your specific zip code, the allowed watering days and times, the slope of the lawn, and sun exposure. There’s a weather sensor installed on-site that accurately tracks your local weather condition as it changes around-the-clock and adjusts your watering schedule accordingly. This prevents over watering and under watering. Classifying soil type for each irrigation zone. Once we were done installing the new smart irrigation system, Ecoyards helped our North Seattle client fill out the rebate application and coordinated with Seattle Public Utilities for an on-site inspection. Needless to say, the home-owner was pretty pleased. Ecoyards is excited to help you water smartly. Call or email Ecoyards for help installing a smart irrigation system.